A Puggle may inherit any of the good, or bad, characteristics of their parent breeds. Appearance is the most obvious indicator of this. Puggles may have the fuller, round head of the Pug, or the longer and leaner head of the Beagle. Their snout may be elongated as their original breeders intended or may be very short like the Pug. The size of your Puggle may vary widely as well. They are typically between 10-30lbs and stand between 10-15” tall. Lastly, the Puggle coat can be any combination of colors from their parent breeds, resulting in endless variety. Since their introduction, the Puggle has experienced an explosion of popularity, particularly over the last 15 years. Their appearance in public with numerous celebrity owners has greatly contributed to their demand. Celebrity status is not the only factor in their popularity. By and large, the Puggle is a lovable breed with a winning personality and an adorable face. The Puggle is widely regarded as an excellent companion dog that brings a lot of personality to the table. They are typically very affectionate, and bond strongly with their owner. They are playful and carefree, with an extremely happy disposition. If your Puggle inherits their Beagle sense of smell, which often happens, they will frequently chase off after scents. Puggles are also known to be stubborn, as both the Pug and Beagle have a stubborn streak in them. They are, overall, an intelligent breed that is sensitive. Nearly all Puggles are quite social with strangers and animals alike, and love to be the center of attention. The Puggle’s small size and generally affectionate demeanor make them an excellent choice for families living in urban environments or apartments. Training a Puggle can be a difficult task, and will require a patient owner. Puggles are sensitive to their owner’s mood, so positive reinforcement training will bring about the best results. Scolding or punishment may result in negative behavior and set back training. Puggles should be socialized early, which should be an easy task since they are a social breed by nature. As a Puggle owner, expect some amount of stubborn behavior, particularly near the beginning of training. If your Puggle inherited the Beagle’s innate curiosity and sense of smell, expect a dog with a shorter attention span that will frequently run off during training to chase down a scent. Exercise needs for a Puggle will vary depending on if they inherit Pug or Beagle energy levels. Pugs by nature are a relatively low energy breed that is content to relax. Beagles are much more energetic and playful. As a general rule, it is recommended to bring your Puggle on a moderate daily walk, or energetic play session. If your Puggle has very high amounts of energy, your long walk will probably need to be supplemented by a vigorous play session. Puggles are a relatively healthy small breed that lives between 10-12 years on average. Are Puggles a Popular Breed? By all accounts, the Puggle is currently one of the most popular hybrid breeds in the United States. Many argue that the Puggle is by far the most popular and common hybrid breed. Without AKC recognition, this is hard to quantify, but suffice to say that the Puggle is incredibly popular and commonly seen across the country. The Puggle is often toted around in public by celebrities, and they are widely regarded as the ideal hybrid or designer breed. The Puggle has no specific feeding requirements. To keep your Puggle healthy and happy, you should seek out a good quality food that meets all of their nutritional requirements. Look for a food that contains a balance of high-quality proteins, vegetables, and healthy fats. Avoid any food that uses grain fillers such as corn, soy, and wheat, as these are harder to digest and can lead to allergies. How much you feed your Puggle will be determined by their weight and energy levels, both of which vary widely in the breed. Expect to feed your Puggle somewhere between 1-1¾ cups of dry food a day, split into two even meals. If you have a 30lb Puggle with a very high energy level, you may need to feed them a bit more. The Puggle is a very easy breed to groom. Both the Pug and Beagle have a short-haired coat that is low maintenance, and consequently, the Puggle has this as well. Brush them once or twice a week to minimize shedding and keep their coat healthy and clean. Most Puggles have the longer snout of the Beagle and are thus less prone to infection in the folds of their face. It is still a good idea to check this area on your Puggle when grooming. Puggles should be bathed about once every month to keep their skin healthy as well. Are Puggles Good with Children? Puggles are great with kids of all ages. They are rambunctious and playful and love nothing more than to play with children. Puggles that are on the smaller end of the breed, or weigh around 10lbs, should be supervised when playing with children so as to ensure they don’t get hurt. Many Puggles in the middle of the breed weight, around 20lbs, are the ideal size to play with children. Puggles are affectionate and loving towards kids and seem predisposed towards family life. Stenotic Nares: Stenotic nares, or pinched nostrils, are a condition that negatively affects the ability to breathe in Puggles. This condition comes from the Pug parentage, and may not present at all in Puggles that receive the Beagle’s nose structure. In some cases, however, Puggles can have severely occluded nasal passageways. Essentially stenotic nares result in a difficulty to breathe. This condition is characterized by the loud, noisy breathing commonly seen in Pugs. Intolerance to exercise, particularly vigorous exercise, is common with this condition. Obesity exacerbates this condition, placing even more pressure on the Puggle’s airways and breathing. In mild cases, weight management and avoiding exercise on hot or humid days mitigates the impact that stenotic nares have. In more extreme cases, surgical correction of the nasal passageways is necessary to facilitate airflow. Hip Dysplasia: Hip dysplasia is a condition characterized by a malformation in the connection between the femur and pelvis, resulting in a loose connection. When this connection is too loose, as the bones rub together during movement or exercise the cartilage padding the bones begins to wear unevenly. As the cartilage wears unevenly it forms scar tissue and bone spurs, resulting in increasing difficulty to move, debilitating arthritis, and eventually lameness. Hip dysplasia is an extremely painful condition that results in a deteriorated quality of life as the dog ages. This condition can be assessed from a young age by a thorough physical examination by a veterinarian. Patellar Luxation: This is a condition that occurs when the patella, or kneecap, becomes dislocated from where it is supposed to reside on the femur. This typically occurs suddenly during exercise or play. Patellar luxation is an extremely painful condition that should be immediately evident. Your Puggle will experience sudden lameness in one of their front limbs, refuse to put pressure on a limb, shake one leg repeatedly, and be in obvious pain and distress. Patellar luxation is a condition that primarily affects small breeds, with miniature and teacup breeds having an increased risk. Both Pugs and Beagles suffer from patellar luxation, so be mindful of the signs and symptoms when exercising your Puggle. Epilepsy: Epilepsy is a condition wherein the dog suffers repeated seizures. Typically, these seizures are tonic-clonic in nature, meaning the dog exhibits signs of muscle movement such as shaking of legs or tremors throughout the body. Seizures are almost always accompanied by loss of consciousness for the duration of the seizure and followed by a period of decreased mental activity and mental fatigue. Seizures in dogs are generally divided into two categories: idiopathic, seizures that occur with no underlying medical condition, and symptomatic, seizures that are a symptom of an underlying medical condition. Treatment for idiopathic seizures typically takes the form of a medication to reduce or eliminate occurrence. Symptomatic seizures are treated by addressing the underlying medical issue that is causing the seizures. Puggles most often suffer from idiopathic seizures, which are an inherited condition. Cherry Eye: This is a condition where the third eyelid of the dog, or the eyelid resting directly alongside the eyeball, becomes protruded and exposed. Once exposed this eyelid quickly becomes irritated and inflamed as it is exposed to dust and debris. The inflammation of this eyelid results in a very red appearance, giving rise to the name “cherry eye”. In more mild cases cherry eye can be treated through medication to reduce inflammation and return the eyelid to its natural resting spot. In more severe cases, surgery will be necessary to correct this condition. Hyperthyroidism: Hyperthyroidism is a condition affecting the endocrine system where the thyroid gland produces excessive amount of hormones. These hormones are responsible for regulating metabolic activity. In cases of hyperthyroidism, dogs experience increased metabolic activity. Signs of hyperthyroidism are vomiting, weight loss, excessive drinking and urination, increased appetite, rapid breathing and heart rate, and an enlarged thyroid gland. Hyperthyroidism in Puggles is usually an inherited condition and can be regulated by maintenance doses of medication that reduce the amount of thyroid hormones in the blood stream. In rarer cases, hyperthyroidism is caused by a tumor on the thyroid gland, at which point surgical intervention is necessary to remove the tumor and return the thyroid to a normal state. national breed website: Puggle Org. This product is amazing. 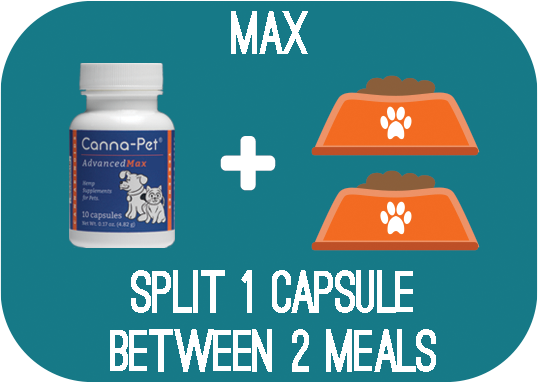 If your fur babies have any issues at all I highly recommend putting them on Canna-Pet.